A camping trip can be an amazing experience mentally as well as physically. When done properly, it can be an exercise in enjoying the beauty of nature, the company of the people who are with you and a chance to bond as men. Done poorly and it can be a complete nightmare filled with cranky people and a general feeling of "when is this going to be over". Here are some tips to make sure your next outdoor adventure is a blast and not a bust. Camping is more than slinging a tent over your shoulder and heading into the woods. 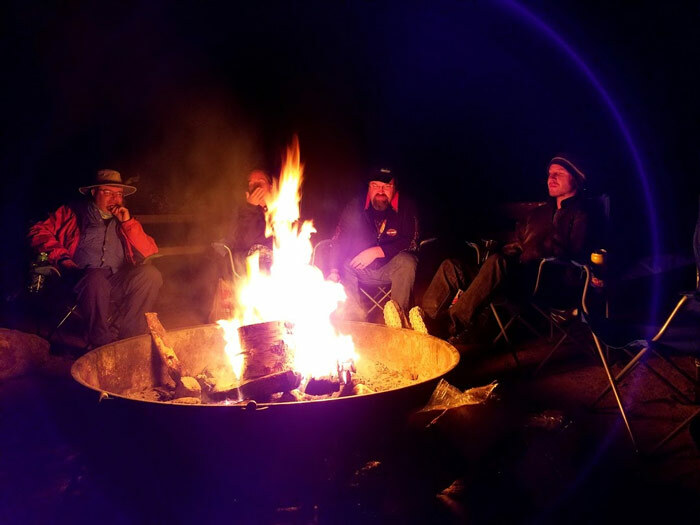 Camping is all about getting back to nature and bonding with the people around you. It's about feeling the land and feeling the beauty of nature around you. It's a lot easier to enjoy nature when you're having a good time, so it pays to be prepared for your next wilderness outing. 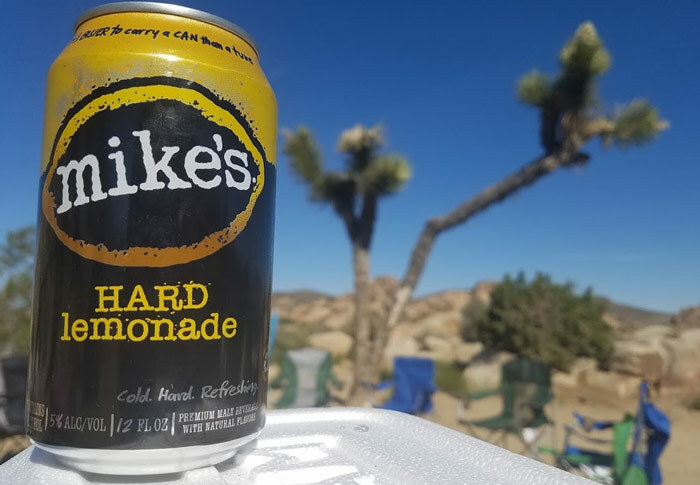 Speaking of being prepared… don’t forget to bring a stash of some Mike’s Hard Lemonade, because man cannot live on beer alone. Don't just grab your gear and head into the wilderness. Do some research before your trip. Look for camping spots in your area that are known to have great views and access to water if possible. On our recent trip to Joshua Tree, originally I had scoped out a "good spot" ... but then found this spot instead that was nestled against a huge rock surrounded by joshua trees and plenty of space to spread out. 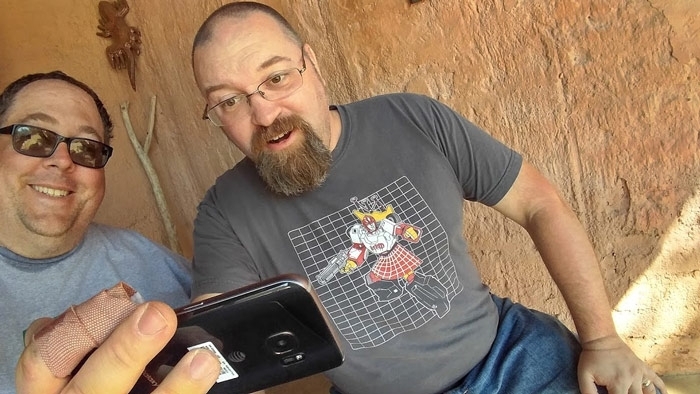 For your trip, make sure to pick a spot that works great for the group - including proximity to bathrooms! That includes great sunrises and sunsets, as well as water sports and fishing, depending on the season. You'll need supplies for your camping trip. If you're not camping at an official campground, bring along lots of water (or in our case if you are out in the desert bring extra). You don't want to drink water from any lake or stream unless you boil it. Also, be careful if you are camping at a high altitude or a dry climate. While alcohol is a great way to relax and unwind after a day full of excitement if you are dehydrated or in thin air it can be dangerous. Also, don't forget the food! 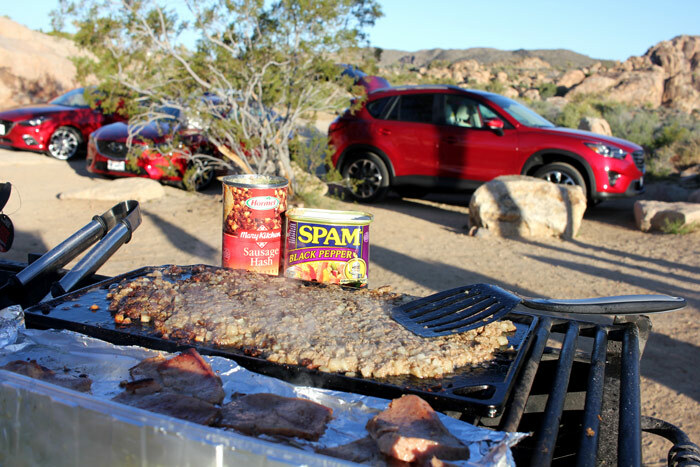 Camping is a great time to try new things and it has a tendency to bring back memories of scouting and camping with your dad so, make sure to bring your favorite foods. Great options include canned goods like chili, sausages, SPAM, Dinty Moore Beef Stew, and of course corned beef hash to go with those pancakes in the morning. Of course, you'll also want to bring lots of Mike's but remember to use cans instead of glass bottles! 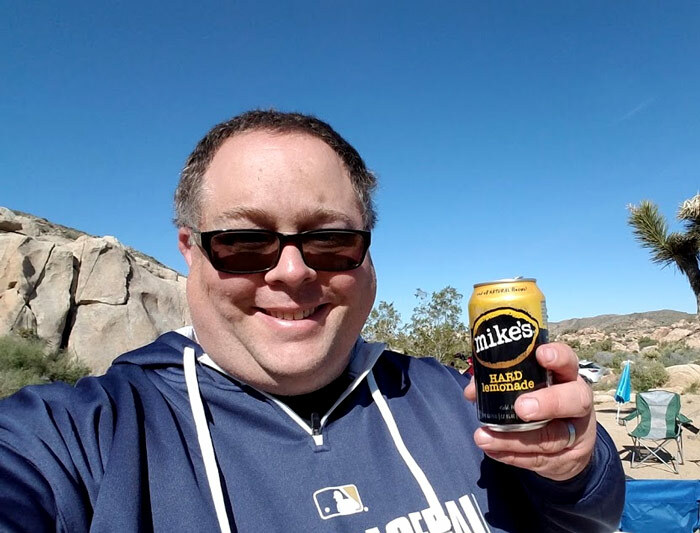 Mike's Hard Lemonade has plenty of refreshing, flavor-packed options, but feel free to choose whichever quenches your thirst. The classic Lemonade flavor tastes best chilled and sipped slow, and great for pairing with grilled favorites or some fireside treats. There's roughing it and then there's masochism. Make sure you've got a great tent that's easy to set up. Look for a tent with excellent ventilation, an inner flap with webbing to keep out bugs, and something that's easy to set up. The last thing you want to do is spend 4 hours putting up your tent. A great sleeping bag is a must. Make sure you get one that has plenty of padding for warmth and for comfort while you're sleeping in your tent. You'll also want something to cook on. Campfires are great for S'mores and hot dogs, but that's about it. Bring along a high quality camping stove to cook any fish you catch (if you're into that) or any other foods you might have brought along with you. Remember the corned beef hash and SPAM? And don't forget your lanterns, and extra fuel or batteries, depending on what kind of lantern you use. Don't forget to bring along your entertainment. Horseshoes and Corn Hole are great games for camping trips but it's up to you these days if you want to bring along digital entertainment too. If you're musically inclined, bring along your guitar, as well. Nothing goes as well with campfires and ice cold Mike's as guitar playing while belting out your favorite songs. Don't worry - you're alone in the desert and no one can hear you screams singing except a few wandering coyotes and rattlesnakes! A perfect camping trip is all about attitude. If it gets started on the wrong foot, you're going to have a few days of cranky people who hate the trip and hate you even more for forcing them to come. Rather than deal with restless camp folk with pitchforks, get your ducks in a row from the beginning. Do a little planning, find a great spot, bring some entertainment, and you'll be good to go for a great camping trip. So I say Cheers! 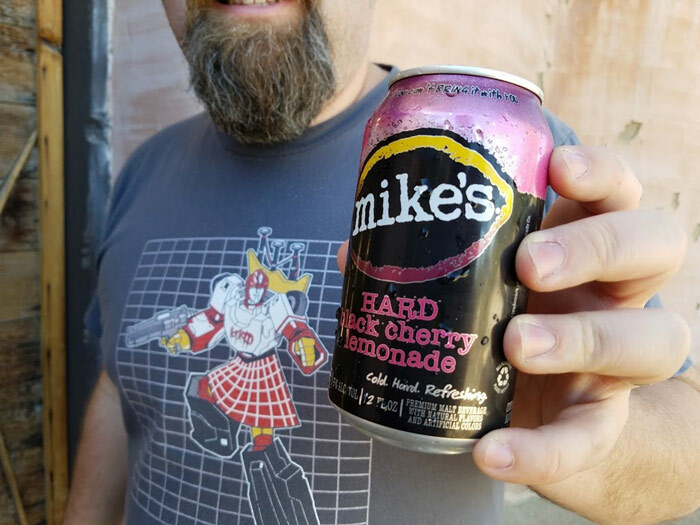 Have another Mike's (the Hard Black Cherry Lemonade is seriously awesome – it’s tart yet sweet and you can definitely taste the hints of cherry and grape) and set off to explore what god created. It's up to you on how you want to do it, but planning is the key to making it a great success! I Survived Electric Daisy Carnival!